Written by Published 14 September 2015 by A.S. The wheels have been spinning fast in Bio4Energy these past six months. Barely had the Swedish energy minister Ibrahim Baylan been to visit Bio4Energy at Umeå, Sweden, when it was announced that one of the Bio4Energy member organisations had been taken over by the SP Technical Research Institute of Sweden, and become the SP Energy Technology Center. Biorefinery à la Bio4Energy was the focus of the Umeå Renewable Energy Meeting 2015, in March, and kept many a Bio4Energy researcher busy in its run up and during the event. Come late April, the evaluation by Swedish authorities of Bio4Energy’s first five years in operation was released and appeared to give overall good marks for performance and leadership. Finally, the early summer months of 2015 have seen a number of visits by external researchers, consultants or industry representatives to Bio4Energy, and the International Congress on Combustion By-products and their Health Effects held in downtown Umeå. Bio4Energy researcher Stina Jansson (left) opens the 14th International Congress on Combustion By-products and Their Health Effects, at Umeå, Sweden. 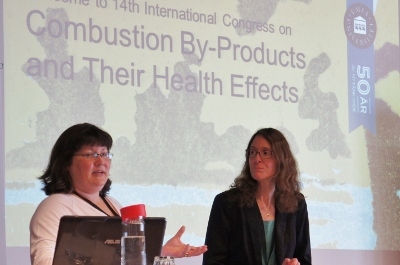 Photo by Lisa Lundin.Toxic emissions of dioxins and flame retardants in connection with biomass burning and other uses were two much discussed topics at this year's International Congress on Combustion By-products and their Health Effects, including on the conference sidelines, according to a Bio4Energy researcher in charge of PIC 2015. "Especially the session on flame retardants and the speech by Åke Bergman [of Swetox and the Swedish Royal Institute of Technology] was very interesting. A representative from IKEA also described how in some countries they have to add flame retardants to their furniture even though they do not want to" because of laws in these countries which mandate it, said Jansson, who is a senior lecturer at Umeå University, with reference to the multinational furniture giant headquartered in Sweden. 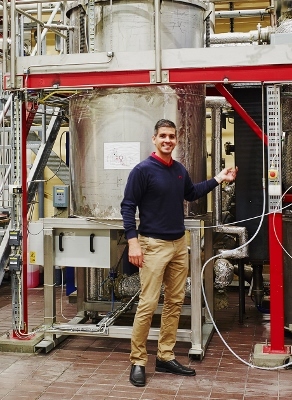 Magnus Marklund and his team at the SP ETC will be able to continue the development of applications of biomass-based pyrolysis oil, thanks to new funding grants from the Swedish Energy Agency and Kempe Foundations. Photo by Maria Fäldt.Pyrolysis of biomass—thermochemical decomposition of wood or organic waste at elevated temperatures and with minimal presence of oxygen—could be an "interesting" option in a transition to replacing today's fossil oil with renewable alternatives, according to a Bio4Energy expert on the thermal conversion of biomass to fuels and chemicals. 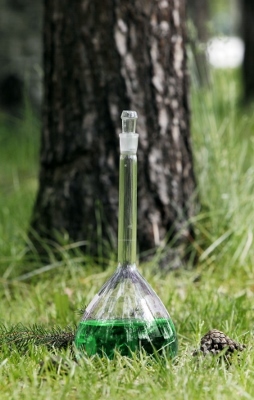 Thus far, however, lack of knowledge about the composition of the bio-oil obtained from pyrolysis of wood or woody waste has been a hindrance efficiently to design techniques for producing and using such bio-oil, to believe researchers in Bio4Energy at the SP Energy Technology Center (SP ETC) at Piteå, in Sweden. Bio4Energy is upgrading its website and would like to ask all visitors please for a little patience. We are receiving the kind help of web developer Simon Birve of the Swedish University of Agricultural Sciences to tweak formats and modules in shape. We started the upgrade 4 June 2015 and expect to need a week-to-ten days to have this "new" bio4energy.se fully functional. Actors from the chemical and forestry industries in Sweden, as well as academia and research institutes, have worked together since 2012 to assess the feasibility of plastic makers' at Stenungssund switching part of their raw material base from petrochemical to woody feedstock. Their report shows it is possible but that political support measures would be needed to make the production of "green" chemicals cost efficient on a commercial scale. Photo by courtesy of SP Processum.In terms of technology, the chemical industry at Stenungssund, Sweden, could make the switch today to a renewable raw material as a partial base for its production, according to a recent report from a Swedish national Forest Chemistry project, using existing technology for making plastics from petrochemicals. However, for the industry to achieve a level of profitability when using wood or woody waste as feedstock comparable to that of using chemicals refined from fossil oil, political support measures similar to those in place for certain types of bioenergy production would be needed, the report authors from SP Processum and Chalmers Technical University say. The research in Forest Chemistry focused on three tracks of the chemical-making operations: Production of butanol, olefins and methanol extracted from the sulphate process of pulping operations. An environmental impact assessment was performed by Bio4Energy researchers at the SP Technical Research Institute of Sweden in the form of a life-cycle assessment attempting to gauge the environmental and climatic impact of switching 25 per cent of the raw material base for the totality of the production at the industrial cluster to woody feedstock, as compared with a continued used of petrochemical feedstock. "We have examined the preconditions both for processes in which cellulose-based ethanol and methanol made by gasification of raw materials from the forest are produced as starting materials from the production of chemicals and plastics. The project results show that it is feasible to use existing techniques, even if additional technological progress is welcome as it would make the processes more efficient. "Looking at the technical side of things is very important since, in addition to bulk products, one could make high value-added products. 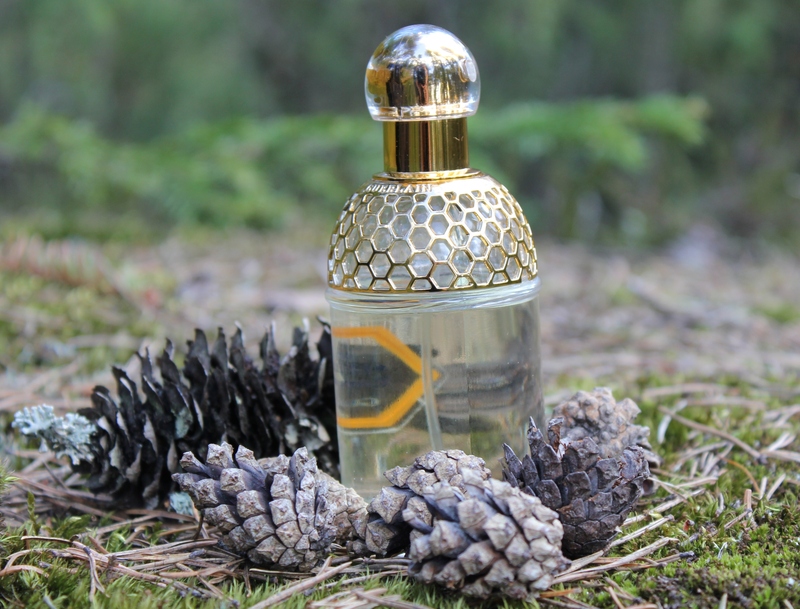 There is good reason to continue the work, for instance on lignin products", according to Jönsson. Bio4Energy’s LCA researchers on the project stressed the importance of assessing the sustainability of products coming out of the cluster along their collective value chain. Bio4Energy researchers have reviewed different ways of upgrading tall oil residue from pulping operations to value-added chemicals. The researchers belive there is money to be made by industry from harnessing some of the options found. Photo by Bio4Energy.Researchers in Bio4Energy have published a review article designed to guide biorefinery industry looking to make value-added products from side streams of pulp and paper production such as crude tall oil from trees. This is an area that is attracting the attention of several industrial operators in the vanguard of trying to make renewable chemicals with properties similar to chemicals refined from fossil oil. Just as the Nordic Paper Journal noted in a recent article, there is likely to be big money to make from side streams of the pulping process. The Bio4Energy researchers point to several routes by which substantially value-added fragrances, pharmaceuticals, bio-based plastics, renewable diesel, specialty chemicals or even jet fuel may be made. The Bio4Energy researchers' 29-page review article gives a complete overview of the latest research on various compounds extracted from turpentine—produced worldwide in approximately 35,000 tonnes each year as a side stream in chemical or mechanical pulping of wood—and treated by heterogeneous catalysis. The article appeared in the April 2015 issue of the Chemical Reviews which receives even more citations by other researchers than the prestigious scientific journals Nature or Science. Bio4Energy is being evaluated for its first five years a biorefinery research environment. The Swedish government is expected to decide whether to grant Bio4Energy a second five-year operational period, 2016-2021. 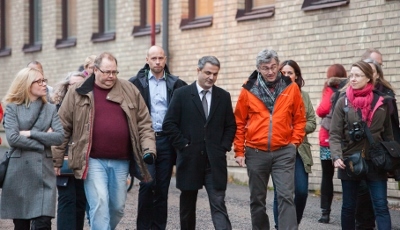 Sweden's energy minister, Ibrahim Baylan (centre), came to visit Bio4Energy at Umeå in November 2014. Photo by Mattias Petterson.Bio4Energy has received good marks for leadership, research and development and outreach, in an evaluation by Swedish authorities aided by an international panel of experts. The evaluation essentially targets the scientific quality and "strategic" leadership of the research environment in its first five years in operation, 2010-2015. It feeds in to an assessment of Bio4Energy by its main sponsor, the Swedish government, which is expected to decide by the end of the year whether to grant funding for second operational period for the research environment in 2016-2021. In total, 43 government-funded "strategic" research environments (SREs) were evaluated by five government bodies and an encompassing evaluation report was forwarded to the Swedish government 30 April. It is understood that Bio4Energy was in the top third of research environments which "currently meet the objective of achieving the highest international standard", according to the report entitled Evaluation of the Strategic Research Area Initiative 2010-2014. A look at the fine print of the evaluation report reveals that the research output of Bio4Energy is "[in] the frontline", which was the highest possible level of rating given by the panel of experts, the two other two levels being "reaching international standards" and "not convincing so far".